Biography of Neoclassical Architect to Empress Catherine the Great. One of the great architects of the Romanov court in St Petersburg, during the 18th century, the Scottish designer Charles Cameron is famous for the Neoclassical architecture he designed for Empress Catherine the Great (ruled 1762-96). Influenced by Roman architecture, as well as Greek architecture, and by the work of Robert Adam (1728-92), he focused mostly on the design of country palaces and landscaped gardens. In addition to designing and decorating for Catherine, he also designed buildings for Paul I (1796-1801) and Alexander I (1801-25). He was succeeded as chief architect by the former interior decorator Vincenzo Brenna (1747-1820). Famous examples of Cameron's Russian classicism include: the Pavlovsk Palace (1781-86) and the Alexander Palace (1812) near St Petersburg, as well as the Razumovsky Palace (1802) at Baturyn in the Ukraine. Important contemporaries of Cameron included: Giacomo Quarenghi (1744-1817), the foremost exponent of Palladian architecture; and Matvey Kazakov (1738-1812), a neoclassicist and one of the top Muscovite designers. Much less is known about Cameron's career before and after his service for Catherine, and his reputation as one of the eminent neoclassical artists is based on his designs for the German-born Empress. Born in London, the son of a carpenter and builder, Cameron trained under the architect Isaac Ware (1704-66), who was an acknowledged expert on Italian Renaissance architecture and the style of Andrea Palladio (1508-80), and who produced the key English translation of Palladio's Four Books of Architecture (I Quattro Libri dell'Architettura), complete with his own illustrative engravings. After Ware's death, Cameron continued his work for a new edition of Lord Burlington's Fabbriche Antiche, a treatise of ancient Roman art. He visited Rome in 1768, where he surveyed the Baths of Titus, as well as the remains of other public baths in the city. Returning from Italy in 1769, he published the results of his research in 1772 in a book entitled: "The Baths of the Romans", complete with detailed documentation in English and French. Few details are known of his career between 1769 and his departure for St Petersburg in 1779, except that - through no fault of his own - he became embroiled in a financial scandal involving his father, who was jailed in Fleet Prison for debt. In Russia, meanwhile, the classically-educated Empress Catherine II was becoming dissatisfied with being surrounded by Baroque architecture, and quickly perceived the "imperial" image potential of neoclassical art. Through her European agent Baron Melchior Grimm, she recruited several neoclassical designers and decorators including Cameron, who arrived in St Petersburg in 1779. Catherine took an instant liking to the Scot, being much impressed with his drawing skills as well as his knowledge of both Greek art and the monuments of ancient Rome. Cameron began by working on the expansion of the Chinese Village at Tsarskoye Selo, the settlement which grew up around the Catherine Palace - one of the main summer palaces of the Romanov royal family. Cameron added more living quarters to the Village as well as the Chinese Bridges over the canal. 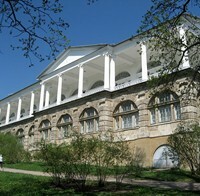 These buildings were the subject of a major renovation by Vasily Stasov in 1817. Next, Cameron was given the task of redecorating the Rococo-style halls of the main section of the Catherine Palace (1780-84), originally designed by the famous Italian Baroque architect Bartolomeo Rastrelli (1700-71) during the 1750s. This, at first relatively modest, project eventually ended up as a major piece of work which produced the most lavish but exquisite interiors of the whole palace, borrowing features from a variety of sources including Robert Adam, Palladio, and Raphael. At the same time, in 1782, he was commissioned to design a two-story bathhouse in mixed classical/Renaissance style with luxurious interiors exemplified by that of the Agate Pavilion. In 1784 the bathhouse was expanded with the addition of Cameron's Gallery - a two-story gallery, with a natural stone ground floor and an upper floor marked with columns. The gallery, decorated with statues of artists and philosophers, was, for years, a favourite walkway of the Empress Catherine. 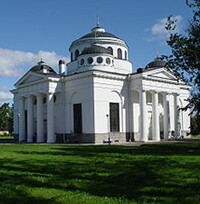 During this time Cameron was also involved in the design of the Sophia Ascension Cathedral near Tsarskoye Selo. On the instructions of Catherine, it was designed by Cameron (and built by the Russian architect Ivan Starov 1745-1808) as an imitation of Hagia Sofia, the Basilica-turned-mosque, in Constantinople - a city Catherine was anxious to liberate from the Turks. In fact, Cameron was less than familiar with the church of Hagia Sophia - an icon of Christian art from the Byzantine period, famous for its icon painting and mosaic art. His design therefore was more classical, with Doric-style porticos on each side, while its five domes were more reminiscent of the Hagia Eirene. See also: Russian Art (c.30,000 BCE - 1920) and Petrine Art (c.1686-1725). 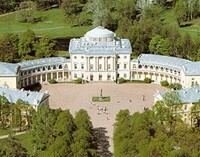 The Pavlovsk Palace was Cameron's most important (and controversial) architectural project. Designed for Catherine's son and heir Paul, it led to a major rift between Cameron and the Tsarevich. The project originated in 1777, when Empress Catherine gave one thousand hectares of forest land along the Slavyanka River, near Tsarskoye Selo, to Paul and his wife Maria Feodorovna, to commemorate the birth of their first son. In 1780, after various preparatory works had taken place there, Catherine instructed Cameron to design a palace on the land. This, he did, in the style of Andrea Palladio, the Italian classical architect with whom Cameron was most familiar. Cameron began by designing two Greek-style pavilions: the Temple of Friendship, a circular Doric temple with sixteen columns under a low dome, containing a statue of the Empress Catherine; and the Apollo Colonnade, another circular Greek-style structure with a double row of columns supporting an entablature, forming an open-air platform for a replica of the Belvedere Apollo (c.330 BCE) created originally by Leochares. For the palace itself, Cameron again employed a design of Palladio, originally used by the latter for the Villa Trissino. Interestingly, the same design was used in America, in the 1820s by Thomas Jefferson (1743-1826) for the University of Virginia. The palace had a three-story cube-shaped central section, with a low dome supported by sixty-four columns, while on either side of the block were two single-story colonnades connected to service buildings. Cameron also designed the aviary, the Lime Avenue and the private gardens, and planned the original landscape. For 12 months during construction, Paul and Maria travelled the Continent, meeting royalty and acquiring many precious objects, like: Gobelins tapestries, Sevres porcelain, antique marble statues, oil paintings, fine furniture, clocks, chandeliers, ancient pottery and ceramics, all for Pavlovsk. While they were away, they maintained constant contact with developments at Pavlovsk through their on-site supervisor of construction, Kuchelbecker, to whom they issued a stream of instructions on the smallest details. Such interference, plus the need to accomodate an ever-increasing number of decorative items, greatly irritated Cameron, who was also accustomed to working with an unlimited budget for materials. Paul and Maria, however, had only a small budget to offer, and were becoming increasingly worried about Cameron's costs. Moreover, they were not happy with the garish polychrome decoration used by Cameron, and wanted a more muted colour scheme. Above all, Paul did not want anything at Pavlovsk that reminded him of the Catherine Palace at Tsarskoye Selo. As a result, in 1786, Paul placed the Florentine designer Vincenzo Brenna (1747-1820) in charge and sacked Cameron, who continued working on Catherine's building projects, in the Crimea, the Ukraine and elsewhere, until her death in 1796. See also: Russian Painting: Eighteenth Century. When he became Czar in 1796, Paul dismissed Cameron from all his posts and retook possession of the latter's house in Tsarskoye. We know that to make ends meet Cameron was forced to sell his collection of books, but little is known of his architectural activities during Paul's 5-year reign, except for a short period (1800-1) when he built the Ionic Pavilion of Three Graces at Pavlovsk, for Maria Fyodorovna. Cameron's fortunes improved after the death of Paul, when his successor Alexander I appointed him chief architect at the Russian Admiralty. During his tenure in this post (18021805) Cameron designed the Naval Hospital in Oranienbaum and produced several blueprints for the Naval Cathedral in Kronstadt. In 1805 he retired. He spent his last few years living in St. Michael's Castle (Paul I's favourite residence, also called the Mikhailovsky Castle or the Engineers' Castle) in the centre of St Petersburg. He died in 1812. A strange but talented individual, he spoke no Russian, had few Russian friends, and was cordially disliked for his arrogance. Yet he remained in Russia until he died. At his peak, he was the architectural confidant of the Empress of Russia; but ended up designing naval barracks. One of the designers of the US Capitol Building. Designer of the Baltimore Basilica. Designed the Massachusetts State House. Designed numerous blocks in London. Designer of the Royal Saltworks, Arc-et-Senans. Designer of Arc de Triomphe, Paris.  For more about neoclassical architecture in Russia, see: Homepage.